The Model AS-09 Fluid Lines & Fittings Trainer is a display of several types of fluid lines fittings and their assembly techniques. 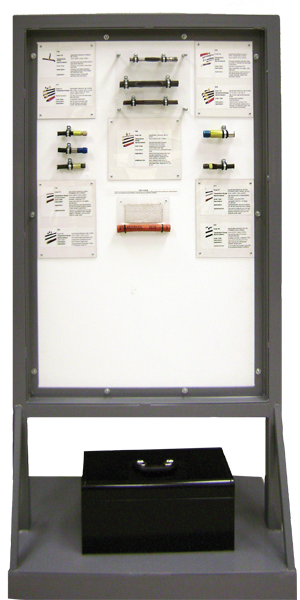 The display shows the aircraft standard for assembling, routing, and supporting fluid lines. Also shown are some examples of common mistakes to teach the students to avoid those mistakes. A tool kit is provided for hands-on practice for assembling solid and flexible fluid lines. Four examples of correct/incorrect flexible hoses, and two examples of correct/incorrect solid lines. Eight examples of rubber hoses construction include samples of light inner steel braiding, heavy inner steel braiding, and inner/outer steel braiding; displaying examples of low and high pressure applications. One example of fire sleeved rubber hose included. Rubber hoses on the back panel show Stratoflex types 111, 112, 124,130, 154, 170, 171, 191, and 193 hoses. Eighty seven types of fittings are mounted on the panel. Three examples of flared connections include single and double fared ends and fittings. The trainer is configured as vertical standing panel, on caster wheels with brakes. The components / hoses are mounted in the front and the back of the panel.